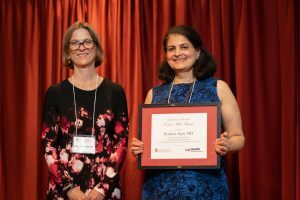 Congratulations to Pathology Professor, Rashmi Agni, who was recognized by the Department of Medicine for her exceptional pathology services in GI and Hepatology and for her teaching and mentoring of GI and liver Fellows. The “Extra Mile Award” was presented to Dr. Agni as part of Medicine’s annual recognition and new faculty reception, on October 3, 2018. The award is made to a UW faculty member outside of the Department of Medicine who has made significant contributions to the Department of Medicine. Next post: Kaitlin Sundling to Compete in Cytology Shark Tank!